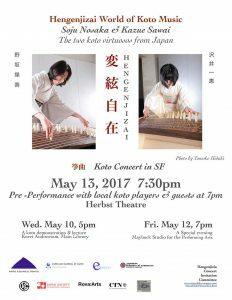 “Hengenjizai” is a concert project founded in 2011, organized by the two Japanese koto virtuosos, Soju Nasaka and Kazue Sawai. They are pioneers of contemporary koto music, who have been active on the front lines of the contemporary music world. In this project, the two koto virtuosos have performed together throughout Japan. Their splendid, dynamic, elegant and rich performance enraptures audiences. Specifically, their performance of Tadao Sawai’s 1983 composition for koto and 17-string bass koto, “Hyakkaffu” (meaning, “Multitudes of Flowers”) is receiving great critical acclaim and has appeared on television.